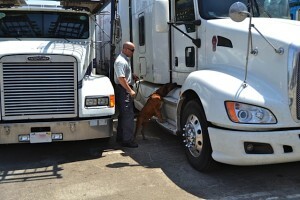 Impact Canine Solutions specializes in Business Drug Detection Services using our specialized drug detection dogs. Code of Federal Regulations prohibits the use of alcohol and illegal drugs and intoxication at work. Drug use among employees can cause expensive problems for business and industry, ranging from lost productivity, absenteeism, injuries, fatalities, theft and low employee morale, to an increase in health care, legal liabilities and workers’ compensation costs. According to the National Council on Alcoholism and Drug Dependence, Inc. (NCADD) drug abuse costs employers $81 billion annually. Employers must make every effort to maintain a drug-free work environment and minimize intoxication at work. Many drug screening options are open to employers such as blood, urine, breath, or other product of the human body that is capable of revealing the presence of drugs or their metabolites. Testing has always been a huge challenge to employers. Using Impact Canine Solutions (ICS) drug detection canines for random searches limits the intrusiveness on employees, can create a drug free workplace and has little impact on daily activity. ICS K-9’s are trained to detect commonly abused drugs and medications, alcoholic beverages and gunpowder based items/firearms. We sweep common areas, including lockers, lunchrooms, parking lots, warehouses, office areas, desks, sleeping quarters, hallways, etc…Our dogs are able to locate the odor of both small and large quantities of drug odors even when they are concealed deep within vehicles and other locations. They are also able to locate the source of narcotic odor even if the drugs have been removed or relocated. This is what we call a “residual odor”. This service can detect if employees have drugs in their possession, improve productivity and decrease the liability of work place accidents. It also creates a strong deterrent against employees selling, storing, or using narcotics and demonstrates a commitment to the well-being of employees. Our visit and the outcome are totally confidential. Impact Canine Solutions is not affiliated with law enforcement or government agencies and are not required to notify them of any findings. If you have questions about our private drug detection services or would like more information, please feel free to contact us. Impact Canine Solutions can design a program that is suitable to your company. According to the Occupational Safety & Health Administration (OSHA), nearly 12.9 million employees actively abuse drugs in the workforce.